Irish Pensions & Finance (IPF) are one of Ireland’s leading financial advisors to the public and private sectors providing expert advice and a range of financial products to over 11,000 clients. IPF wanted to provide a pension calculator app to allow Public Sector workers to calculate what pension entitlements they will receive from their Superannuation scheme at retirement based on their years service. The aim of the app was to enable IPF build a targeted database of potential clients. By calculating what potential extra retirement fund one could accumulate by contributing to an AVC today, the objective was to provide a useful app that would introduce public sector works to the services of IPF and enable them to input their contact details to find out more. 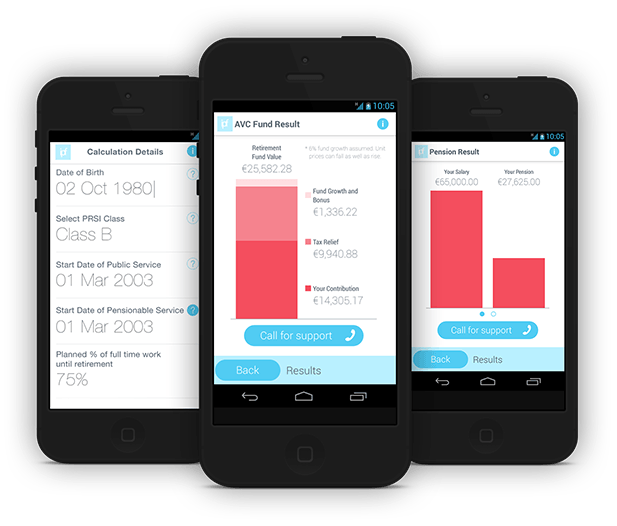 Púca developed the ‘64’ Pension Calculator app in close consultation with IPF’s marketing team. It is available on both iOS and Google Play Platforms. The user interface is clear and intuitive to use, with a robust algorithm ensures that the pension calculator is completely accurate. Once customers are provided with the results of their pension calculation, they are also provided with the option to request a callback from IPF. This enables IPF identify and contact potential customers who are specifically interested in their services. The app also includes a click-to-call button so that customer can speak directly to an IPF representative. The end result is an app that really works for the client’s business by generating targeted leads for their sales team. The app hit No. 2 in the iOS Finance charts just days after release and continues to chart in the top 10 amongst leading finance apps. The app has also generated a high number of 5 star reviews from end-users.